The Formosa Adventurers got a write-up in today’s China Times! We haven’t been able to find an online version, but if you can read Chinese, pick one up and check out page A10! Woo Hoo! If you really want to help us out, go to our contest blog, give us a vote, watch the video and leave a comment. Taiwan’s tourism bureau believe so far that the team with the most special qualities and a lot of interest online is the Formosa Adventurers. Comprising of four guys from the UK and the USA, the Formosa Adventurers have had a lot of people watch their introductory video. They are planning a adventure sports and aboriginal culture-themed trip including river tracing and white-water rafting in Hualian, paragliding and visiting an aboriginal tribe in Taidong as well as experience Zhiben and Jinlun’s hot springs. 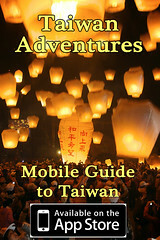 A combination of Taiwanese adventure and aboriginal culture that is very authentic Taiwanese. The team also write about Taiwan’s natural beauty and their own interesting travel experiences in their blogs which are written in English and Chinese. Great to see your group attracting some attention. I hope it leads to greater success.